To offer this money, the result of the sacrificial meal, in a simple white envelope that you mark on the outside ‘Operation Rice Bowl’ and hand in at the Collection at Mass on Sunday. 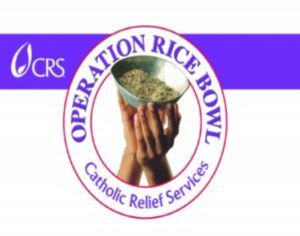 The funds will be distributed to the hungry as follows: 75% to overseas famine areas through Catholic Relief Services and 25% to the malnourished of the diocese and region. Special Lenten Penance Service on Tuesday, March 13th at 7:00 PM. We will have other priests helping us to make that special time of forgiveness a blessed time for you. Please take advantage of this sacred encounter with Jesus who loves you and died to forgive you!